Let’s have some imaginary fun this week. 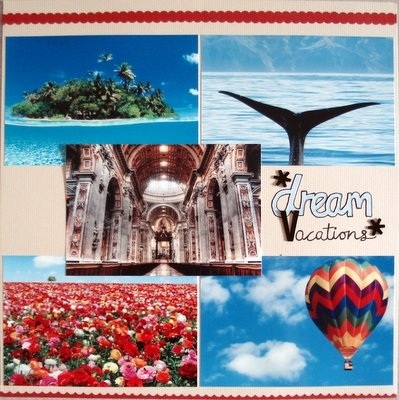 This scrapbooking idea involves finding some photos of places you’ve been dreaming of visiting some day. It’s about your dream vacations after all, and so it’s gonna be one visual feast! Do you have just one dream destination or you have a dozen? Find as many beautiful photos as you can to help illustrate your dream locations/experiences and bring them to life through photos. For a long time, I’ve been desiring to visit an utterly beautiful tropical paradise like Mauritius or Maldives or anywhere else. You’ll see that it’s not specific countries that I’m dreaming of, but the experiences of soaking in crystal clear turquoise waters, whale-watching, flying in a hot-air balloon and basking in a glorious field filled with happy flowers! Oh another one as you can see on my layout, is to visit an old magnificent church with breathtaking carvings or pictures all over the ceilings and walls. Enjoy and have fun with your imaginary vacations! Supplies used: Cardstocks – Bazzill Basics, DCWV Mat Stack; Letter stickers – American Crafts “Thickers” Vinyl; Black pen – Uni Pin Fine Line; Craft scissors – Carl CarlaCraft.